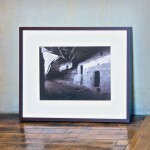 Limited edition, framed silver gelatin print. Hidden deep within a canyon on Cedar Mesa lies Moonhouse. A truly unique architectural site in North America. The recessed location has preserved the amazing white stripe and dot motif along the front of the dwelling. External to the site one can see the snake pictograph often seen throughout the southwest. This is a limited edition, framed silver gelatin print signed by the artist. This is a unique presentation that was made for Oakland’s F3 show, the image is brown toned, matted on off-white board, and framed in a dark wood frame. Framed size is approx 29″x36″.